Great premises, great execution, great book! Summary plot: One night, as Diane and Jason Lawton, twins, and their best friend Tyler Dupree gaze at the sky, the moon and the stars all suddenly vanish — as well as all man-made satellites. The following morning, the Sun rises normally… But it very soon appears that it is just a projection, an image on the inside surface of a massive force field that has been created overnight around Earth. Mankind initially wonders who did that and why… but these questions take a different dimension when scientists realise that time goes faster outside the force field. A lot faster: for each year on the planet, 100 million years pass outside. And this is a bit of a problem because at this rate, Earth has only about 30 years left before the Sun becomes a red giant and scorches it to death. In the face of the impending catastrophe, what can be done? 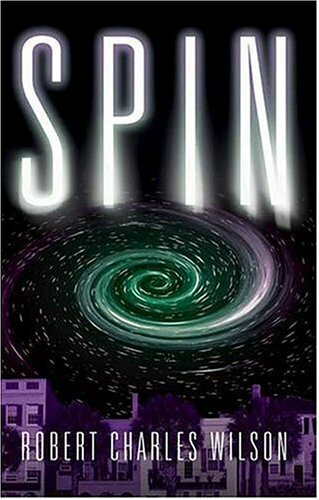 Review: As far as premises go, it is difficult to do better than Spin: unexplained phenomenon, impending doom. This could lead to a nice little potboiler, but Wilson is much cleverer than this and manages to maintain the suspense throughout the novel, thanks in particular to several beautiful twists. Characterization also plays a part in the book’s appeal. Through his main protagonists, Wilson manages to explore all the options opened to Mankind (denial, aggression, anarchy, science, religion, suicide, stoic acceptance…), without ever sounding preaching or studious. Difficult to say more without spoiling all the fun — just know that this is a great book.